This election may be remembered as the year most Republican candidates in Colorado decided not to speak out against Trump. And paid the price. Across the country, only two Republicans congressional candidates have aired ads distancing themselves from the president. 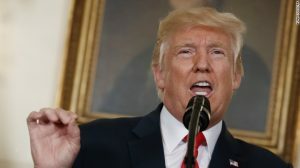 But the pressure to say something about Trump has spiked in recent days as the President’s rhetoric–widely regarded as offensive–has escalated. There’s his continued attacks on Democrats who received pipe bombs. And the press is the “true enemy of the people” (after CNN got bomb threats). And his ongoing falsehoods about rag-tag migrant invaders being a serious danger to the country. And more. Yet, in Colorado, the chosen response of most Republican candidates is silence. In perhaps the state’s two most important races, taking place in suburban battlegrounds where anger at Trump is high, Republican candidates have yet to say a word about the president. Christine Jensen, who’s running for a Wheat Ridge senate seat, describes herself as sitting on the right wing of the Republican Party and specifically aligns with Trump on wanting to repeal the Affordable Care Act. But when asked on her campaign website where she stands on Trump, Jensen won’t say. And she doesn’t return calls seeking comment on the President. Neither does Republican Beth Martinez Humenik, who’s fighting Democrat Faith Winter to retain her Adams County state senate seat. 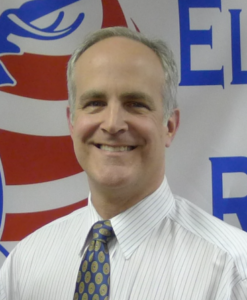 Don Bendell, a Republican who’s running for the state house seat occupied by Judy Reyher, admitted that he started paying court-ordered child support after his three children had grown up. 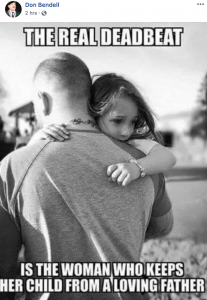 The meme, which depicts a man holding a young girl in his arms, is noteworthy because, by using the phrase “the real deadbeat,” it appears to downplay the problem of fathers, like Bendell himself, who don’t support their children. Bendell: I DID NOT fail to pay child support. I did get behind, owned, and apologized for it. I paid every penny that I owed plus interest. My ex-wife and I lived in Ohio and she took my three children from my first marriage and moved them to NC where she was from in 1979 while I was out of town on a business trip. We got divorced in Ohio and I did not “flee NC authorities,” as I was not even there. Deadbeats run and hide and try not to pay. I DID PAY, every cent. It is old news but salacious and inaccurate slurs have been used against me in this campaign. I have spoken about issues and my solutions for them, and that is what people care about. I do not downplay men who do not pay, but you are downplaying women who use their children as chess pawns in custody battles to attack loving fathers. Children should never be put between parents in a divorce as kids always find a way to blame themselves in such adult matters. Bendell’s children alerted the Pueblo Chieftain to their father’s history after Bendell was selected by Pueblo-area Republicans to run for the state house seat against Democrat Brianna Buentello. Tickets are available for Thursday’s “Get Out the Vote Tour” with Republican candidate for governor Walker Stapleton and his “special guest,” U.S. Senator Cory Gardner (R-CO). The Nov. 1 events, organized by the Colorado Republican Party, will take place across the state, starting in Grand Junction at 9:30 a.m., Durango at 12:15, Pueblo at 2:30, and Greeley at 5 p.m.
Free “Red Wave” tickets to attend the events can be reserved on Eventbrite. “Please join Republican Nominee for Governor, Walker Stapleton, and Special Guest Honorable Cory Gardner on Thursday, November 1st at 9:30 am for our Get Out the Vote Tour! Stapleton will be speaking to attendees about the importance of the upcoming election and volunteering to help with his fight against Congressman Jared Polis!” states the Eventbrite page for the Grand Junction stop. 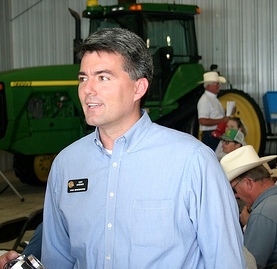 Gardner’s low approval ratings in Colorado–falling even below Trump at 25 percent earlier this year–didn’t dissuade Stapleton from campaigning with Colorado’s junior senator, who’s up for re-election in 2020. After Thursdays stops, which skirt the front range, Stapleton continues his tour without Gardner at other locations, including along the front range, through Monday. Stapleton has repeatedly said he’d like to campaign with Trump as well, but the President’s schedule didn’t permit this, Stapleton told KNUS recently. Democrats launched their own get-out-the-vote tour last week, featuring a blue bus that’s made stops around the state. Joining Democratic candidate for governor Jared Polis on the bus yesterday in the Denver area were Democrats Gov. John hickenlooper, Lt. Governor Donna Lynne, former state Treasurer Cary Kennedy, Houston Mayor Annise Parker, and others. U.S. Sen. Michael Bennet (D-CO) has also joined the bus along the way. Polis appeared with Vermont Senator Bernie Sanders last week. After a much-publicized launch and big plans to become a serious player in Colorado politics, Unite Colorado’s slate of self-described independent candidates has mostly failed to gain traction, been hit with multiple campaign finance complaints, and continued to rely on out-of-state money and wealthy California donors. The latest setback for the group, formerly known as the Centrist Project, came yesterday when a Durango resident filed a campaign finance complaint against Paul Jones, who’s running against Democratic State Rep. Barbara McLachlan in a swing Southwestern Colorado state house seat. It’s one of multiple campaign grievances that Unite and its candidates face, and it alleges illegal campaign coordination, which means Jones could face civil charges and serious fines. 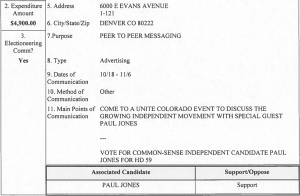 The Unite Colorado Election Fund is an Independent Expenditure committee, which means it can spend money in support of candidates but not coordinate or strategize with them. On October 18, however, the committee spent nearly $4,900 on advertising for an event with the candidate himself. Since September, Unite Colorado and its candidates have been the subject of six campaign finance complaints, all currently listed as open by the Secretary of State. The first complaint, filed last month, is under review by the Attorney General’s office. Four other complaints against Unite Colorado and its candidate campaign committees have been filed this month by longtime conservative gadfy Matt Arnold’s entity, Campaign Integrity Watchdog. On October 26 the Secretary of State office found that Arnold’s initial complaint against Unite Colorado has “alleged sufficient facts” to merit review. Conservatives are spreading unsubstantiated rumors today that Democrats or their allies planted a white van that was seized today in conjunction with the arrest of a suspect in the case involving bombs mailed to Democrats. Federal authorities covered and seized a white van in Florida after the Department of Justice confirmed an arrest had been made in the bomb investigation. The suspect was arrested at an auto repair shop in Plantation, Florida. Aerial footage captured images of the van before it was taken away. Some of the van’s windows were covered with stickers. 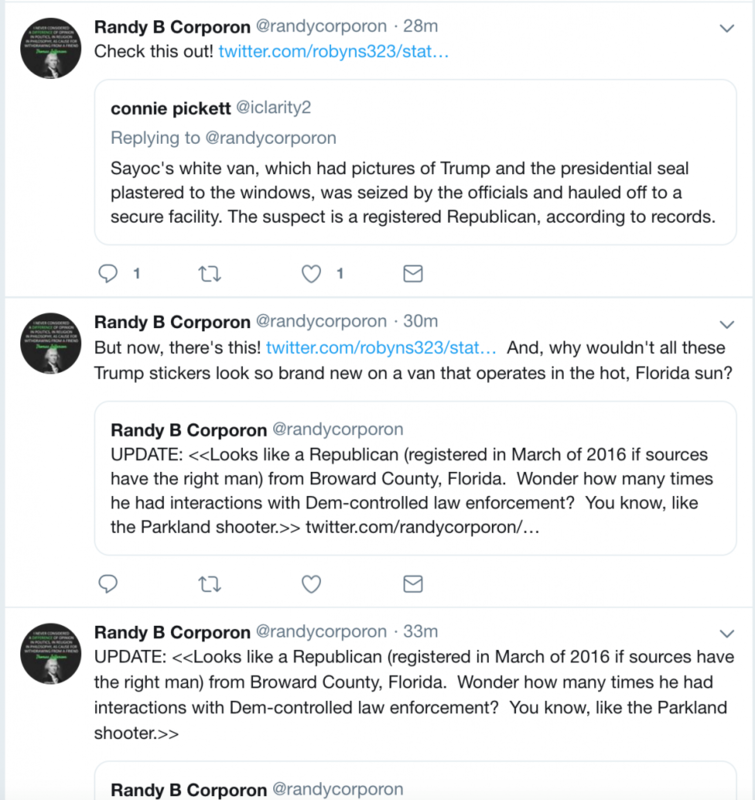 A phone message seeking a comment from Corporon wasn’t returned, and a search for any evidence backing up the KNUS talk radio host’s conspiratorial tweets turned up nothing. Trump congratulated law enforcement officials for their work on the case today, after encouraging news outlets earlier to drop the matter and instead cover political issues leading up to the upcoming election. “Republicans are doing so well in early voting, and at the polls, and now this “Bomb” stuff happens and the momentum greatly slows – news not talking politics. Very unfortunate, what is going on. Republicans, go out and vote!” tweeted Trump. Two Democratic state senate candidates are under attack for voting for bipartisan gun-safety legislation that would allow police to take guns from mentally-ill people. Why? Because they backed a so-called “Red Flag” bill that would have allowed law enforcement officials to ask the courts for permission to temporarily seize guns from people who are deemed to pose a “significant risk” to themselves or others. The proposed law was also supported this year by second-highest ranking Republican in the Colorado state house. The Red Flag legislation emerged in response to multiple mass shootings by mentally ill people, including the Aurora theater shooter, who was found by a jury to be insane. The bill aimed to take guns from such people, with a judge’s permission. Tom Mauser, who lost his son Daniel Mauser in the 1999 Columbine High School massacre, told the Colorado Times Recorder that the “red flag law could have prevented the Aurora theater tragedy” as well as the Parkland High School shooting in Florida. The red-flag bill was killed in Colorado’s Republican-controlled senate in May, after passing with bipartisan support in the house. Republicans are trying to hold their one-seat majority in the Colorado state senate in part by defeating Democrats Danielson and Winter in their Jefferson County and Adams County races (Senate Districts 20 and 24). Danielson faces Republican Christine Jensen, a businesswoman, who’s been endorsed by the National Rifle Association (NRA), which favors candidates who oppose most gun control bills. 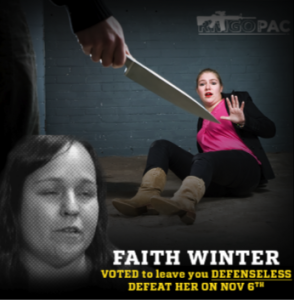 Winter is running against Republican State Sen. Beth Martinez Humenik, who also got the NRA endorsement in the race. Concerned Citizens for Colorado, a dark-money group that purchased Facebook data from the disgraced firm Cambridge Analytica and used the personal information to help win key Colorado senate seats in 2014, is pumping a half million dollars into the Colorado Republican Party again this year. In 2014, Concerned Citizens used the Facebook information, which was obtained improperly, to create profiles of 136,000 voters in five Colorado swing districts. It paid for the research on behalf of the Republicans’ Senate Majority Fund, a GOP entity charged with winning state senate seats. 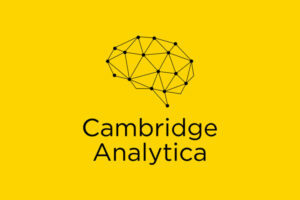 Cambridge Analytica told Colorado Republicans that it could, for example, target voters with “neurotic personality traits, for instance, who may respond well to messages that scare them, such as politicians who want to impose tougher gun regulations,” as characterized by The Denver Post. One of those swing districts where these profiles were used: an Adams County state senate race where Beth Martinez Humenik prevailed by just 900 votes in 2014, helping put the GOP in control of the senate chamber for the first time in a decade. That’s a key race again this year, as Republicans try to protect their one-seat senate majority, and presumably the outfit that hired Cambridge Analytica is back for a command performance. After doing its work in Colorado, Cambridge Analytica went on to use Facebook data to help elect Trump in 2016. In fact, Danielson was born in Colorado and grew up near Ault in the northern part of the state. She currently resides in Wheat Ridge. Jessie is the third generation of her family calling Wheat Ridge home. She grew up on her family’s farm near Ault. Her grandmother has resided in Wheat Ridge for nearly sixty years, and Jessie’s mother, aunt and two uncles are all proud graduates of Wheat Ridge High School. 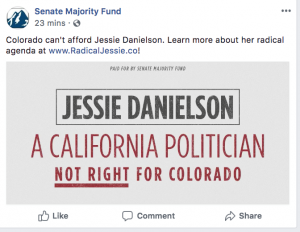 A call to the Senate Majority Fund, which paid for the advertisement, was not returned, but presumably, the Republican organization wants to paint Danielson as an outsider somehow tainted by California. The baseless attack on Danielson mirrors widespread Republican campaigns to brand Democrats as California radicals. For example, an outfit called State Solutions, which is connected to the Republican Governors’ Association, paid for a series of “RadiCalifornia” ads, trying to link Jared Polis, the Democratic candidate for governor, to alleged California craziness. “Jared Polis wants to turn Colorado into RadiCalifornia,” states one of the ads, without mentioning that his Republican opponent, Walker Stapleton, was born in Connecticut. And a lot of Colorado residents weren’t born here, obviously. Danielson faces Republican Christine Jensen in the state senate race to represent segments of Jefferson County, including Arvada, Wheat Ridge, Golden, and other communities. Jenson did not return a call from the Colorado Times Recorder. Jenson has passed up the opportunity to comment on other topics, including where she stands on President Donald Trump. It’s past time for reporters to start asking more key Colorado candidates where they stand on Trump. Don’t yowl that it’s an unfair question, somehow beyond-the-pale partisan because Trump is so unpopular in Colorado and not relevant to state races. 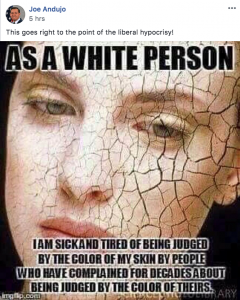 If that’s what you think, you’re wishing you lived in a different America. Trump’s presidency permeates every single political race and decision in our country, affecting every aspect of government and related issues (Bill of Rights, courts, press, FBI, EPA, voting, and so much more). His rhetoric and style upend civil discourse. Whether you agree with that or not, you have to admit that Trump is a revolutionary-type force in our country. As such, the opinions of all candidates about Trump should available to voters. I don’t mean to say journalists have ignored candidates’ views on Trump, but the reporting has been spotty and, in the legislative races, it’s been absent in many cases, even in the state senate races that are so critical in this election. Objectively, these are legitimate questions for any candidate in the year 2018. Yet, many Republicans in key Colorado races have yet to answer them. Here’s what we know so far. Stapleton previously said he wants Trump to campaign with him in Colorado, so his acceptance of Trump’s “complete and total” endorsement doesn’t come as a surprise. Stapleton has little choice but to cozy up to Trump, even though the President lost Colorado by five points in 2016, making such a strategy risky, say political observers. With Democrats highly energized to vote, and independent voters leaning left in the polls, Stapleton has no chance of winning if even a fraction of the Republican base doesn’t show up at the polls in November, political analysts say. So if Stapleton were to distance himself from Trump, he’d potentially piss off Trump-loving GOP voters, making them shake their heads in disgust and stay home on election day. Stapleton isn’t alone among key Colorado Republican candidates in embracing Trump. Others include George Brauchler, who’s running for Attorney General, State Senator Tim Neville of Littleton, who’s a candidate for a critical state senate seat, Brian Watson, who’s running for State Treasurer, and others. Stapleton (Here at 21 minutes): I was really happy to have the President’s support, and here’s what Coloradans have to recognize. President Trump is going to be the president for the next two years. And it will help Colorado to have a governor who has a collaborative productive relationship with the White House and President Trump. We rely on the federal government for everything from school funding to infrastructure funding to the future of healthcare in Colorado. I’ll be able to walk in the front door of the White House. Jared Polis won’t get his calls returned. That’s not going to help the state of Colorado. And so I’m happy President Trump endorsed me, and I welcome his endorsement. Will The President Endorse Other Trump-Loving Candidates In Colorado? 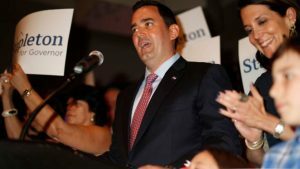 Walker Stapleton’s “complete and total endorsement” this week by Trump came as a surprise, in part because other Colorado candidates, who’ve also backed Trump, did not get the President’s kiss of approval. Colorado’s Republican candidate for governor appears to be the only candidate who’s invited Trump to Colorado to campaign with him, but other local Republicans have lavishly and loyally supported Trump. For example, George Brauchler, who’s battling Democrat Phil Weiser to be Colorado’s Attorney General, told fellow Republicans last year that “we’re in pretty damn good hands right now” with Trump, and he called on other GOP candidates to come forward and tell voters if they also cast a ballot for the President. A handful of local state senate races will determine whether Republicans lose their majority in the chamber–and likely hand control of Colorado state government to Democrats. Some of the Republican candidates in these senate races have stayed silent when it comes to Trump, but Littleton GOP State Sen. Tim Neville, who faces Democrat Tammy Story, is a loyal and vocal Trump backer, who joined other Trump leaders in Colorado this year in celebrating Trump’s “year of greatness” to mark the President’s first full year in office. 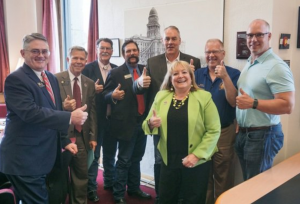 Beth Martinez Humenik, who’s facing Faith Winter in a swing Adams County district, appears to be in Trump’s camp due to the fact that she recently appeared with the President’s Interior Secretary Ryan Zinke and gave him the thumbs up in a photograph. An email to Humenik’s office seeking clarification of her stance on Trump was not returned. Calls to Wheat Ridge Republican Christine Jensen and to Tony Sanchez, who’s running for a Lakewood senate seat, were also not returned. On the Democratic side, President Barack Obama endorsed the Democratic candidates, including Winter and Story, in the key races that will likely determine which party controls Colorado’s senate chamber. Gardner’s comments came as leaders of both political parties have said the confirmation of U.S. Supreme Court Justice Brett Kavanaugh was one of the lowest moments for the senate in decades. “I think what’s broken is the filter that people used to have that would actually restrain them from thinking that violence is okay, and pushing the edge too far on civility,” Gardner told KFKA’s Gail Fallon. Gardner didn’t say what rollbacks that Democrats want to re-instate. But Democratic leaders have been critical of numerous protections and regulations Trump has rescinded, including environmental rules (limiting climate-change pollution from cars) and immigration regulations (DACA and zero-tolerance immigration policy) and more. With regard to taxes, Democrats have objected to Trump’s new tax law, which increases the national debt while lavishing tax breaks on the wealthy compared to what was given to low-income groups. Gardner’s belief that the U.S. Senate isn’t broken may stem from his promise when he ran for his seat in 2016 to go to Washington and be a fixer. “When something is broken, I’ll fix it,” he said in an ad attacking then U.S. Sen. Mark Udall, a Democrat. Gardner ticked off the “accomplishments” of the senate to show it’s working. 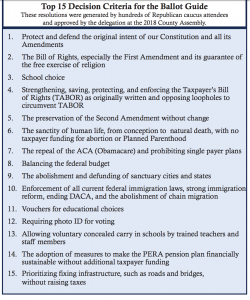 The Jefferson County Republican Party has issued a ballot guide that neatly lays out the Republican right wing agenda, even though the Jeffco area is known to be among the purplish parts of state. But when it came to Amendment 74, a far-reaching attack on the government’s ability to impose even the most modest health and safety regulations without potentially facing unsustainable financial liabilities, Jeffco Republicans joined a growing list of moderate Republicans in holding back support. It took “No Position” on Amendment 74, but its comments were rather gloomy. Unknown impact as this constitutional amendment has far-reaching implications. Just compensation is already guaranteed under the Colorado and US Constitution. It is likely there will be substantial financial impact to taxpayers as they will be on the hook for all future judgments. An organization backed by Republican billionaires Charles and David Koch is attacking Democratic State Sen. Kerry Donovan of Vail, who is facing GOP challenger Olen Lund in the upcoming election. The Koch organization, called Americans for Prosperity (AFP), mailed advertisements to voters in Donovan’s sprawling district in the central mountains. The ads attack Donovan for her sponsorship of legislation promoting “net neutrality,” which aims to prevent giant corporations from dominating the internet, according to its proponents. Donovan is running to retain one of five swing senate seats in Colorado that will likely determine which party controls the senate chamber, where Republicans currently hold a one-seat majority. Donovan’s bill, HB18-1312, would have prevented state-funded companies that offer internet services from charging additional fees based on internet speeds, blocking lawful internet content, or instituting other measures to regulate traffic on the internet. It’s a local version of national net neutrality policy measures, which are generally supported by Democrats and opposed by Republicans, including Trump. The Koch Brothers’ AFP organization says net neutrality legislation hurts the ability of businesses to develop and expand their internet operations. The Colorado chapter of AFP is associated with the national AFP. At the national level, AFP has waged a multi-faceted campaign to roll back Obama-era regulations favoring net neutrality. Trump appointees to the Federal Communications Commission sided with conservatives, but the overturn of Obama’s net neutrality protections has stalled in the U.S. Senate. 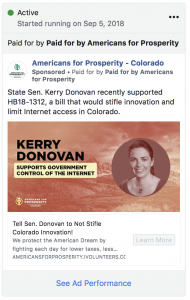 In Colorado, Donovan’s bill would “stifle innovation and limit internet access in Colorado,” states AFP Colorado in one Facebook advertisement attacking the Democrat. That’s what Colorado’s Republican Party leader, Jeff Hays told KCOL radio host Jimmy Lakey Friday. Hays agreed, comparing the Kavanaugh hearings to debates over sexual harassment at Colorado’s Capitol this year. Hays: “Absolutely, they tried the same stunts at a different level in the state senate during the last session, where they had a bunch of accusers that were claiming some of our state senators had unwarranted touching or made offhanded comments that were offensive. And it was the same kind of thing. Well, you know, people lie all the time. I get lied to every day in this business. I get lied to by women. I get lied to by men. This year, multiple reports by independent investigators found credible evidence that male legislators harassed women at the Colorado capitol over many years. One Democratic State Rep. Steve Lebsock was expelled from the Colorado Legislature in a bipartisan 52-9 vote, with 16 Republicans joining Democrats in concluding that the lawmaker was unfit to continue serving. Lebsock denied accusations, deemed probably true by an outside investigation. In April, Republican state senators voted mostly along party lines not to expel fellow Republican State Sen. Randy Baumgardner from the Senate, even though outside investigations found that he more likely than not slapped the buttocks of a female assistant multiple times in 2016. Later, more accusations were substantiated against the Republican from Hot Sulphur Springs. You’d think that little or no depth of thought would be required to question the veracity of this alleged news article, in part because everyone in the state of Colorado and the world would have heard about it–and seen it on TV ad nauseum–if it were a fact. 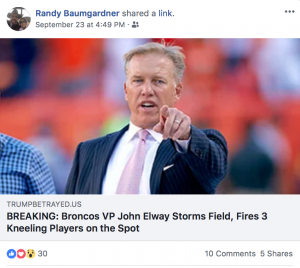 But who would expect Baumgardner to take five-and-a-quarter seconds to visit the Google and check his own facts before hitting the share button on Facebook, given that Baumgardner has repeatedly poisoned us with fake news in the past? And he’s an elected official? None of these events took place. The Broncos have no players named Mavius Malphner, Ladamian Brown, or DeShaq Darq. Like everything published by America’s Last Line of Defense, the article is fake. However, some readers mistakenly believed it to be authentic, as demonstrated by the many earnest comments on the Facebook page of America’s Last Line of Defense. Only seven Colorado legislators have signed a pledge not to post fake news on their social media accounts, even though elected lawmakers in Colorado have been repeatedly caught posting false information, made to look like real news, on Facebook. 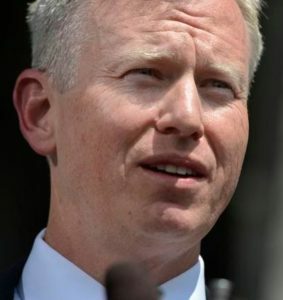 The Republican candidate for Colorado attorney general, George Brauchler, is now more skeptical than he was this spring of legislation allowing law enforcement officials to ask the courts for permission to take guns from people deemed to pose a significant risk to themselves or others. His new assessment of so-called “red flag” legislation comes in the wake of what he sees as the abuse of such laws, like one in Broward County, Florida, convincing him that the focus should be on mental health care not a red flag bill. Colorado’s version of red flag legislation was defeated in May by senate Republicans–after clearing the state house in a 37-23 vote, with support mostly from Democrats but some Republicans as well, like Assistant Minority Leader Cole Wist (R-Centennial), who was a sponsor of the bill. “I don’t think Colorado can go that direction—or should to in that direction—if we have the ability to tackle this same problem without having to confront the Second Amendment,” Brauchler said. Red-flag bill proponents argue that the gun confiscations in Broward County, show that the law is working. Since the law was passed there after the Parkland high school massacre, through July, 108 gun confiscations occurred, including 28 relating to domestic violence, 45 connected to mental illness, and 34 relating specifically to people contemplating suicide. “I want to stay away from taking on the Second Amendment and really focus on, how can we really help people and keep them from hurting themselves and others, whether it’s by a gun or a car or whatever,” said Brauchler. “I did not support Trump in the primary, no question about it. On the positive side, Suthers is “very happy” with Trump’s nominations to the U.S. Supreme Court. He’s happy with the “tax changes,” and he’s felt the U.S. needs immigration reform. “The jury is still out on tariffs,” said Suthers on air. Suthers, who served as Colorado’s Attorney General, told Randall he’s always looking for the best “path to become a good ancestor,” and his current job fits the bill for now. The conservative Colorado Springs Gazette tried today to argue that U.S. Rep. Mike Coffman (R-CO) isn’t as pro-Trump as his 96 percent pro-Trump voting record would have you believe. The newspaper lists 15 examples, including bipartisan measures to provide hurricane relief and reduce opioid addiction. Trouble is, if you throw out these 15 bipartisan votes from Coffman’s list of pro-Trump votes, the Aurora Congressman still has a 95 percent pro-Trump voting score. And if you subtract 15 more votes, among the 90 House votes on which Trump had a publicly known stance, Coffman’s pro-Trump score is 93 percent. Coffman’s core problem is that he voted just four times against Trump. One of those four votes was on an important healthcare bill, as the Gazette points out, but Coffman later expressed support for another Trump-backed bill to kill Obamacare. 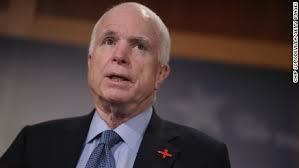 It was defeated in the U.S. Senate, due to the downward thumb of former Arizona Sen. John McCain. 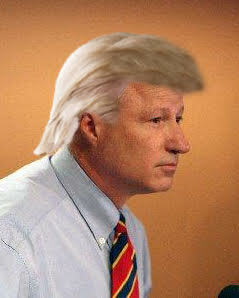 With Coffman in danger of being washed out of office by the blue wave, the conservative Gazette will try to argue that Coffman isn’t as Trump-loving as he appears, but his pro-Trump voting record won’t prove the point. St. George says correctly that Coffman challenged Trump sometimes, but he goes too far in concluding Coffman “opposed” Trump on the Affordable Care Act (ACA). St. George correctly reports that U.S. Rep. Mike Coffman voted against a House bill, backed by Trump, that would have repealed and replaced the ACA, also called Obamacare. But it’s misleading of St. George to conclude that Coffman straight-up opposed Trump on Obamacare, based on Coffman’s single congressional vote. In fact, Coffman actually supported the U.S. Senate’s final anti-Obamacare measure, called the “Skinny Repeal,” which failed with U.S. Sen. John McCain’s thumb pointing to the floor. Trump lobbied heavily for the “Skinny” repeal. After McCain’s famous thumbs down, Coffman told Channel 9 political reporter Marshall Zelinger that, unlike McCain, he would have backed the “Skinny” Obamacare repeal, calling it “viable” to him as a “negotiating tool” to get it to a conference committee. That’s what numerous Republicans were saying at the time. But had the skinny repeal passed the U.S. Senate, it could have become law without further negotiations or a conference committee. That’s one reason McCain opposed it. 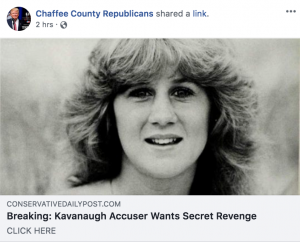 The Republican Party in Chaffee County, Colorado, spread a fake news report this week alleging that “secret revenge” is the real motivation of the woman saying she was sexually assaulted by Trump’s Supreme Court nominee Brett Kavanaugh. The allegation, determined to be “false” by the fact-checking site Snopes, was that Brett Kavanaugh’s mother, who was a judge, ruled against the parents of Christine Blasey Ford, who says she was assaulted by Brett Kavanaugh. 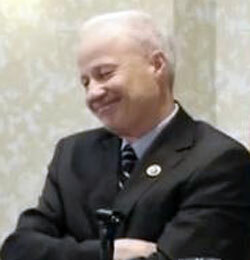 U.S. Rep. Mike Coffman (R-CO) is hopping mad about a political advertisement, produced by House Democrats, claiming that Coffman has voted with Trump 96 percent of the time. The 96-percent-pro-Trump score is the “bogus” work of an “East Coast blogger,” said Coffman in a news release, citing 15 votes that shouldn’t be counted as pro-Trump votes because they were passed with bipartisan support, even though Coffman voted as Trump wanted him to. But even if you toss out all 15 votes, which indeed had the support of anti-Trump Democrats, you still find that Coffman voted with Trump 95 percent of the time. Silver identified a total of 90 votes that Trump either supported or opposed. That’s all the votes Trump took a stance on. Coffman went against Trump’s wishes on only four votes of the 90 taken. If you throw those 15 votes out, Coffman would have voted against trump on only four of 75 votes. That’s 95 percent of the time. If Coffman wants to show that he stood up to Trump more often, he needs to find more instances when he voted against the president. Anti-Trump members of Congress, who voted with Trump on bipartisan measures, had low pro-Trump voting scores, because they voted against Trump so often. Via email, I asked Coffman’s spokesperson, Tyler Sandberg, if he could cite more than four anti-Trump votes by Coffman, and he didn’t respond or offer any comment, as requested. A spokesman for U.S. Rep. Mike Coffman of Aurora told a reporter Monday that Coffman broke away from Trump on healthcare. That should sound familiar, if you’ve been following Coffman, because he’s been saying it early and often since last year. In fact, it’s only partially true. Coffman supports what’s essentially a Trump proposal to repeal Obamacare now–but implement the repeal at an unspecified later date. In other words, Congress would pass legislation now with a deadline/date for repealing the law sometime in the future. 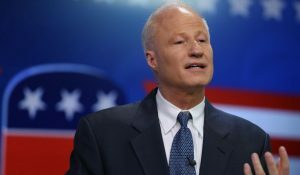 After the U.S. Senate’s dramatic failure to kill Obamacare, Coffman told a Denver TV station he’d have backed a bill to do away with the national health care law–a move that would likely have pushed millions off the health insurance rolls. Asked by 9News’ Marshall Zelinger last year (at 1:30 here) if he’d support a “straight repeal” of Obamacare, Coffman said yes. The Colorado Republican Party’s candidate for lieutenant governor apparently backs Trump not only now but also in the 2020 election. State Rep. Lang Sias (R-Arvada), who’s Walker Stapleton’s running mate, became a “new member” of a Facebook group called “MAGA Trump Colorado” last week, according to a Facebook post obtained from a source. “Let’s work together to fulfill his vision of making, and keeping, America great,” states the group’s Facebook page. Recent posts on the MAGA Trump Colorado website show bigotry to Muslims and hostility toward people of color generally. Stapleton’s campaign did not return an email to confirm his MAGA Colorado membership and seeking to know if Sias 1) was aware of the bigotry on the MAGA Trump Colorado site and 2) would consider withdrawing his name from the site. 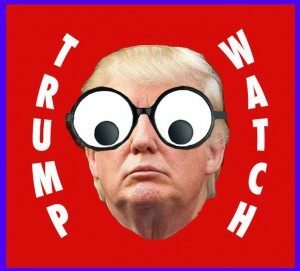 Another question for Sias that went unanswered: Is there anything Trump could do, or information that could be revealed, that would stop Sias from voting for Trump again, as Sias is apparently committed to doing?